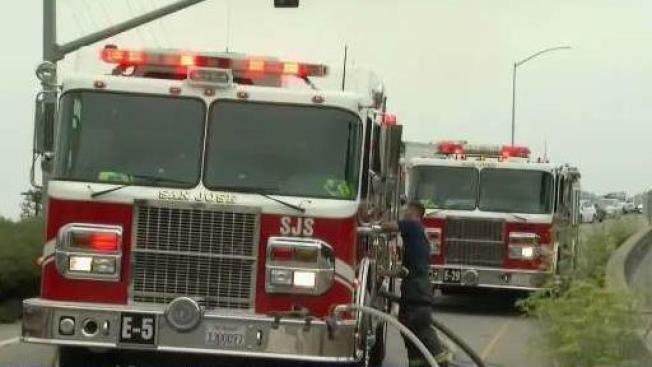 Firefighters on Tuesday battled a brush fire that ignited at a homeless encampment off of southbound Highway 87 near Mineta San Jose International Airport, according to officials. The fire marks the latest in a number of homeless encampment blazes that have taxed the resources of the San Jose Fire Department in recent time. A battalion chief said firefighters respond to at least five homeless encampment fires on a daily basis. Footage from the scene of Tuesday's blaze captured flames shooting into the air as the blaze torched brush and trees next to the highway. The fire forced authorities to temporarily close the transition ramp from southbound Highway 101 to southbound Highway 87, according to the CHP. All lanes have since reopened. The fire did not impact airport operations, the airport tweeted.